Snowman Christmas Ornament is a festive addition to any Christmas tree! 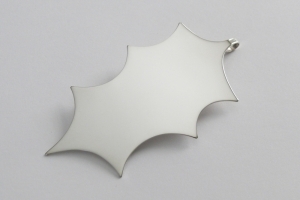 Each ornament is hand pierced from sheet silver and the shape refined by filing and sanding. The slightly domed form gives it dimension and its smooth, shiny surface is perfect for personalizing with hand engraving. The snowman’s arms have a hammered texture.